This article was updated on 17 Mar 2012, and is filed under Research Provocations. Kuleshov, first theorist of cinema, enunciated the concept of montage in 1916. He proposed that montage, the joining together of different shots in a predetermined order, was the ‘primary material’ of cinematic art and the foundation of its visual grammar. ‘Kuleshov was the first filmmaker who began to talk about an alphabet, an organization of inarticulate material, and who worked with syllables, not words,’ writes Pudovkin in the introduction to the director’s first book (Kuleshov, 1974: 41). After viewing the films of D.W. Griffith, Kuleshov created a conceptual inventory of artistic effects possible for cinematography and in his writing he makes repeated references to the depiction of objective reality and spatial representation. Though Kuleshov never made a stereoscopic film, his writing offers insights to contemporary filmmakers as to how actions by actors may be spatially choreographed for greater realism and how shots may be lit and composed to form an impression of greater depth. A primary conception of Kuleshov’s is his elaboration of a spatial, pyramidal grid set before the camera with its topmost point being the camera lens and its rectangular base the motion picture screen itself. ‘The space of his [the actor’s] action represents a pyramid (however abstract), the apex of which rests against the center of the lens of the camera,’ Kuleshov wrote (1974: 110). ‘Thus, the two-dimensional web must transform itself for the actor into a three-dimensional one, situated in the pyramidal space of action.’ In this way, ‘A space can be measured in three dimensions—length, width and depth.’ The actions of the actor will take place within the three axes of this ‘metrical web.’ ‘The good actor,’ adds Kuleshov, ‘will come to terms with the most complete combinations of axes and the most minor inclinations and angles of the metrical web’ (1974:113). Production design and placement of objects within the shot are also important. ‘That same metrical spatial grid,’ writes Kuleshov, ‘and the construction of the shot, applies equally to the mounting of settings.’ He emphasizes that ‘only the clear interrelationship of objects is well and easily comprehended on the screen.The simpler the placing of objects in the shot, the clearer the placing of walls and platforms, the more expressive and understandable the result.’ The importance of visual economy in spatial organization is repeatedly emphasized. 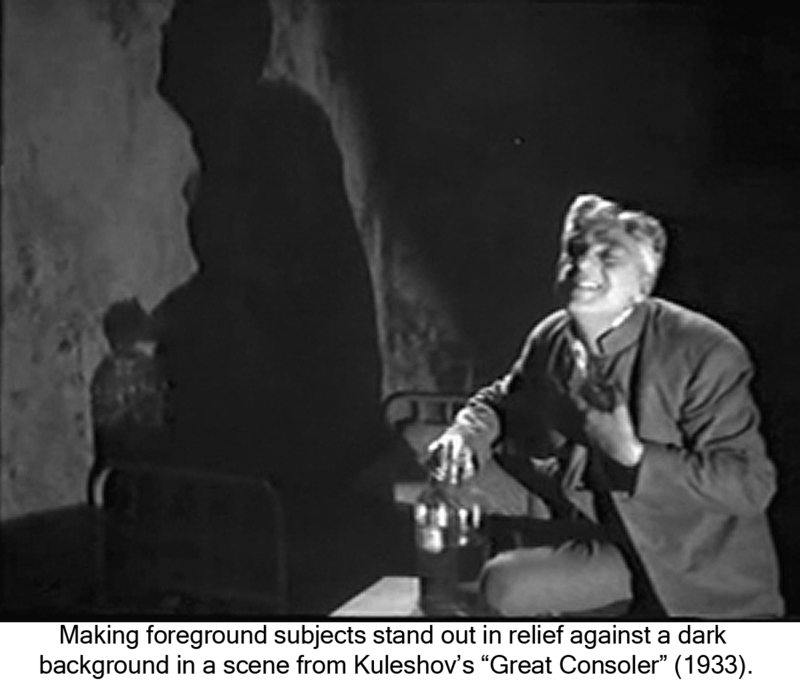 Another primary consideration for Kuleshov, in creating an impression of depth, was the use of the ‘foreground close-up.’ A large-scale object would be placed in the foreground of a shot. ‘It became clear,’ observed Kuleshov, ‘that detail in the foreground greatly heightened perspective, gave the photography greater plasticity and the perception of the decoration greater relief, and to the extent that cinematography tends to lessen depth and stereoscopic effect, this characteristic device became most useful’ (1974:69). It also became clear to Kuleshov that ‘the less that set décor is noticeable, the less attention the viewer pays to it, the less it interferes with the action of people’ moving within it. ‘We wanted the action, that is, the main element in cinema film,’ he wrote, ‘to be most lucid, in relief, and the background to be shaded, to serve only a subsidiary role’ (1974:71). It is through the writing and films of Sergei Eisenstein (Battleship Potemkin) that Kuleshov’s influence is most evident today. Kuleshov’s writings are out of print and all of these notes were taken from Kuleshov on Film, Writings of Lev Kuleshov, a 1974 book translated and edited with an introduction by Ronald Levaco, which is rare and hard to find. Two of Kuleshov’s feature films, The Extraordinary Adventures of Mr. West in the Land of the Bolsheviks (1924) and By the Law (1926) are included in a 4-Disc DVD collection from Flicker Alley issued in 2011 and titled Landmarks of Early Soviet Film. In his Introduction to the book, Ronald Levaco observes that within Kuleshov’s three-dimensional metric web ‘any movement or shape could be explicity mapped, described, and analyzed.’ He adds, however, that ‘what Kuleshov failed to describe explicitly was how this topological notation could be handled’ (1974:10). Nevertheless, it may be perhaps surprising to contemporary readers, editors and filmmakers today just how much thought Kuleshov devoted to the third dimension in formulating his new theory of montage. Kuleshov, Lev (1974) Kuleshov on Film, Writings of Lev Kuleshov, translated, edited and with an Introduction by Ronald Levaco, Berkeley, Los Angeles, London: University of California Press. Landmarks of Early Soviet Film, A 4-Disc DVD Collection of 8 Groundbreaking Films (2011), Los Angeles: Flicker Alley LLC.